When developing your virtual team mission statement think of it as your vision for the future of your team. . .
. . . who are you now, and where do you want to go? The mission statement you develop should represent the collective individuals on the team, the planned goals for the future, and how you plan to get there. Experts believe that at the core of your mission statement you should make the rules by which your team operates very clear. This limits confusion and gives people a unified concept of "who" your team represents. If you say more than one thing then you say nothing. And the truth is, most mission statements read like the ingredients on a cereal box. . .
. . . boring and all the ingredients sound the same. Because of the lack of face-to-face contact on a virtual team, you must restrict any potential spots where misunderstandings may occur. One key to writing your virtual team mission statement, you need to pay attention to the items important to your personally and professionally. So what do you need to pay attention to? As an organized virtual team, you should have a pretty good concept about your customers, both internal and external. You must have a very clear idea of who you serve, and the items you deliver to them. By really paying attention to who your team represents, and the core ideas of what you're trying to accomplish, you begin to really shed light on the core mission of your virtual team. Developing a virtual team mission statement means building, optimizing, and refining until you have a razor sharp mission. By immersing your team in the needs of the marketplace and asking for feedback, you drill and mine the core ideas that grant your virtual team distinct competitive advantage. This helps you visualize the achievable possibilities. Much like most of the leaders I know, you dream to achieve something great. You compile your notes and discover what makes your virtual team special. Here, you really begin to figure out exactly what you do. You begin to see common threads in your everyday working life. These form in the rough drafts of your mission statement. Your work toward combining the best ideas of both. You see the major themes, ideals, and purpose that drives you ahead and makes your team special. Uniqueness is an advantage, make yours crystal clear. The best leaders express the core ideas behind their team in the clearest language and most precise images. Use the below questions to start developing your virtual team mission statement. As you answer the questions just write, express the ideas and words that ring truest for your personally. There is plenty of time to go back and refine your ideas. What makes your vision unique? What drives your ideas and make them different? How do you see your organization in the future? Look forward 1, 5, 10 years in the future and write down the vision you see. How do you see yourself at these points? What images drive you personally? What pictures do you see representing what you do and your vision for the future. What's in it for others? How do you plan to inspire others as they join your virtual team? Don't get wrapped up too much in the end product of your virtual team mission statement, let the ideas flow, let the process work. As you refine your statement, develop a simple mantra that distills the driving force of your team's vision for the future. As you move forward, continue to refine and rework your statement. 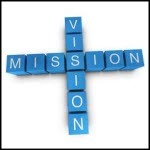 Most teams make a vision statement that stays static. They do it once and never reflect back upon it. In fact, your statement needs to be dynamic. It needs to reflect your customers and your team. The only thing constant in this world is change. Your vision statement changes too with time.